There are more than 500 playgrounds across Canberra but only $1 million to spend. File photo. 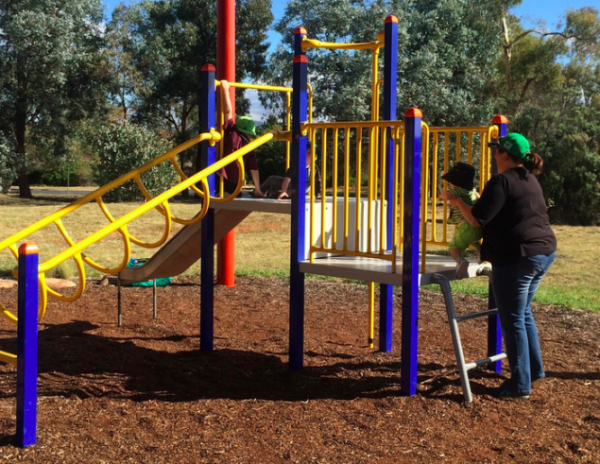 The ACT Government will allocate $1 million to suburban playgrounds in the upcoming Budget, with a Citizens’ Forum to decide how it will be spent as part of the next phase of the Better Suburbs consultation program. The Government says the planning of Canberra’s future city services, including playgrounds, will now be placed in the hands of 65 members of the community and community organisations, after the results of the first stage of the Better Suburbs consultation, held in late 2017, were released on Wednesday (23 May). The Government says Better Suburbs is aimed at setting the vision and priorities for the improved delivery of city services in the ACT for the next four years and beyond, in the form of a Better Suburbs Statement. Minister for Transport and City Services Meegan Fitzharris said the first stage of consultation showed access to shopping precincts, access to parks, safe and connected footpaths, maintained trees and shrubs, and maintained and connected roads were priorities for Canberrans. She said 40 members of the community, who represent Canberra’s demographic profile, and another 25 from community organisations would take part in the Citizens’ Forum during July and August. “During this process, they will speak to government, industry and non-government representatives about how we can plan for the right mix of city services for Canberra into the future,” Ms Fitzharris said. She said $1.9 million would be set aside in the Budget for local community upgrades, $1 million of which must be spent on playgrounds, and the Citizens’ Forum would be asked how this money should be spent. “Playgrounds are a recognised priority in the Better Suburbs program. They were listed by the community as a top five feature, with the quality of playgrounds valued more than how many there are in each suburb,” she said. The Minister said work would begin on projects after the Better Suburbs Statement was released in September 2018. Ms Fitzharris said other members of the community would be able to participate in ‘kitchen table conversations’ with a Better Suburbs Guide to be available next month that families, community groups and other stakeholders will be able to download and use to discuss the delivery of city services, and help the Citizens’ Forum make decisions. Invitations will be sent to 4000 households in coming weeks, inviting people to take part in the Citizens’ Forum, a deliberative democracy process run by democracyCo, and participants will receive $250 for taking part. A report on the results from the first stage of the Better Suburbs consultation is now available on the Your Say website at www.yoursay.act.gov.au/bettersuburbs. And again I’m sure, like all spending in the capital, Tuggeranong will miss out. Yes those road duplications and the work on the waterways in Tuggeranong is not spending in Tuggeranong. Road duplications. Oh you mean Ashley drive finally. The first road infrastructure project in how long ? Waterways haha. No one wanted or needed that drawn out process down there for the Isabella wetlands. More than happy to hand back that cost blow out. Ben Jones as a user of lake Tuggeranong if it actually means a cleaner lake I’ll be real happy. As a long term Tuggers resident we were lucky most of our infrastructure was built properly the first time. Also the rates in Tuggeranong are the lowest in Canberra so we really are not paying for other work on the Northside. Every morning I hear about traffic jams in the north while I drive to work in flowing traffic. It’s all lovely but given the shocking state of nursing homes in the territory, perhaps alleviating those torturous, murderous conditions should come before playgrounds. We need to get our priorities in order to make ours a decent society. Kids aren’t being starved to death and left in their own filth all night - the elderly in those horrid homes are. They’re being fed on less than $12 per day, they have one nurse for up to 50 elderly bed ridden patients. Surely this isn’t the right focus for a citizens jury. For heavens sake fix the old and run down playgrounds in the areas where poorer families have little amenities or entertainment options for their kids. The kind of people who these play grounds service, will not be the kind of people who are able to voice their views at the forum and probably not the kind of people who would attend the forum anyway. Shade. So many good playgrounds out there that can’t be used during the middle of the day because they are so hot and kids end up with burnt hands and legs. How much will it cost to run the citizens’ forum – public service wages, advertising, payments to participants and democracyCo, etc? Does that cost come out of the $1M? Would that money have been better spent fixing the existing playgrounds? At $1M spread across “over 500 playgrounds across Canberra” that works out at $2,000 per playground on average. That won’t buy much. Either that or some get a lot and most miss out. Hmmmm I think Justin Watson doesn’t know that Ashley Drive was the busiest single lane road in Canberra and was promised and re-promised for duplication and completion for many years and election campaigns. Or that funds for Tuggeranong waterways are primarily from Federal coffers and Mr Barr personally redirected Federal funds dedicated for lake Tuggeranong to his own electorate Lyneham waterway in 2008. The waterway funds were provided at a Federal level because Lake Tuggeranong was one of the worst waterways in Australia, not just the worst in Canberra. See page 4 of this document showing Andrew Barr redirecting Tuggeranong money. Not enough to do anything but fix 1 playground. Then government can just blame the jury again. Where is the governance? We pay people to be town planning architects and ABS to collect stats then just ignore everything and make a us style jury.